Lost Levels :: View topic - Monster in My Pocket Early Prototype Lost Levels - A website about unreleased video games. Like, really early, more of a tech demo than anything. 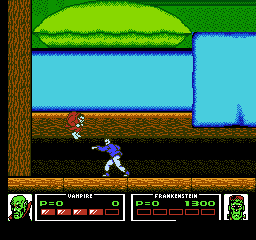 Only the first level, (completely different) music, and basic gameplay are implemented at this point, and the player sprites are still pretty rough. A couple of debugging tools are present in this build: the game starts with a level/character select (you need to use this to see all three parts of the stage, since the game resets at the end of each one), and you can pause the game and scroll the screen around with the D-pad (press A a few times to go faster). Although there's not much to the game itself, a bit of hacking yielded several unused music tracks (some early versions of final tracks, and some unique to this proto) and remnants of at least two other games hidden in the data, including compressed graphics from Crackout in the PRG, and a couple of overworld graphic banks from a prototype version of Ganbare Goemon Gaiden 2 in the CHR (there are some mushroom graphics I couldn't locate in the final version). This will all be documented on TCRF in the coming weeks. Thanks to Arasoi and some very generous donors for saving this bit of Konami history, and to devin for the NSF rip! Cool find! Interesting bit about the other games graphics in it. Still not sure why the US didn't get Crackout. Damn, you guys work quick! I sent the game and ROM out this Saturday, no time wasted there. Probably about 30-35 additional that I haven't gotten around to adding, just thought a few of you may be interested in the list. I dropped $400 on the MiMP prototype and looking at that price list makes my wallet weep. What's that game called? 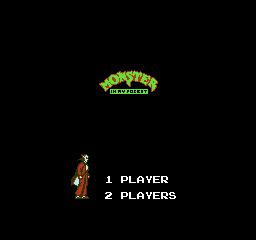 "MONSTER ... ...."
I think you'd be surprised, especially if it is for lost levels guys. Never really thought about dumps, but take the unreleased Fun House game. I'd do like $1k for that dump without too much thought. If you have interest in something, give me a shout and I'd be very willing to work with you. Anyway that Monster in my Pocket proto is cool. Previous Konami "protos" on the Nes were actually demos for use in stores. I think this might be the first one that's genuinely an early build. Also nice to hear some "lost" Konami Nes tunes. That's the one! I got a very early Muppet Adventure proto from the same person as well. Was just using that as an example, even for unreleased games I wouldn't be asking for millions. Again, I've never really thought of cash ROM releases, but if someone wanted one I would be very willing to work with them. I personally do not believe in holding the games hostage like that. I have four undumped prototypes that I wouldn't mind releasing for free. I've released countless unreleased games over the years and will continue to do so. They're not held hostage, they're in very safe hands. They're also for sale, so anyone can be the hero you're trumpeting about! No, I mean that for some of those games they raise money in order to release the ROM. Maybe there's something I'm missing, but I don't know why they do that. Can't they just release the ROM for free? Of course, but it costs an awful lot of money, and usually even more time, securing these prototypes. It gets prohibitively expensive to spend thousands on prototypes, release them for free, and end up with a cartridge worth a fraction of the initial purchase price.